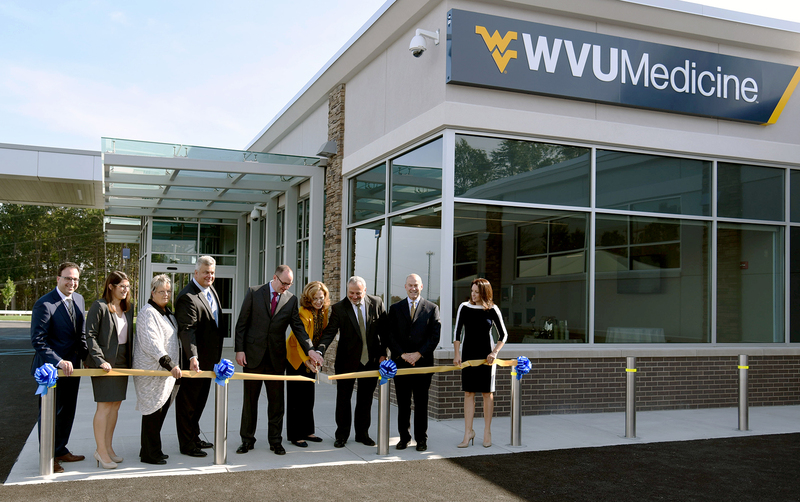 WVU Medicine cut a ribbon on Sept. 22 and officially declared its new clinic in Marion County open for business.The first patients were seen Sept. 25. A photo gallery from the ribbon-cutting ceremony is available on CONNECT. The $13.9 million, 25,000-square-foot outpatient center is located off Downtown Fairmont Exit 136 of I-79, near the Fairmont Gateway Connector. It is owned and operated by University Health Associates (UHA) and includes 39 exam rooms and three procedure rooms. WVU Medicine broke ground on the site June 6, 2016. Over the last four years, there has been a steady increase of Marion County residents traveling to WVU Medicine clinics in the Morgantown area for care. From 2013 to 2016, there was a 129 percent increase in clinic visits. Judie Charlton, MD, chief medical officer of WVU Medicine, said the facility’s services were determined by a community assessment and that further services may be added or tweaked to meet the population’s needs. A total of 65 jobs were created at the new clinic; 90 percent of the positions are filled with Marion County residents. In all, the WVU Medicine system employs more than 1,300 from Marion County. To showcase the new building and providers, a community open house is planned for Saturday, Oct. 21, from 10 a.m.-2 p.m. Watch for more details.